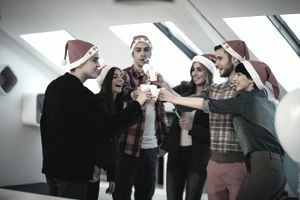 To drink or not to drink at work-related events is a question almost every employee has to ponder for one occasion or another. Whether the business occasion is lunch during an interview, the company holiday party, or a staff networking event on Friday afternoon, alcohol is usually an option. While many employers make careful decisions about de-emphasizing alcohol at company events out of concern for employee safety and other potential legal issues, alcohol is often an option. Employees need to make wise decisions about whether to drink alcohol at a work event—and if drinking—how much. Make your decision about what to drink and how much to drink before you are faced with the choices at the event. Set your limit before the event. This will help you resist the temptation to change your mind when you are actively attending the party. It is very easy to get caught up in the general merriment and revelry and drink (and eat for that matter) more than you actually intended. Never get in the mood for an event by drinking after work at a tavern or starting with a drink at home. These practices will undermine your focus on a safe, enjoyable workplace event with coworkers. Many employees follow the rule of two glasses of wine or two beers over an evening, and this generally works for employee safety and sobriety. You need to decide what will work for you. 14 percent: said that drinking alcohol at a work-related event was never acceptable. Each employee needs to know their own organizational culture and how acceptable behavior is defined to make the decision about whether to drink alcohol at company events. Take these factors into consideration when you make your decision about drinking at a company event or activity. You best know yourself and your organization's culture so these are the important factors for you to consider. Take your first cue from your company culture and the behavior of your coworkers. Do successful employees, managers, and executives drink alcohol at company events? If so, having a couple of drinks is fine. At one software development company, the weekly happy hour on Friday is deliberately called 2Beer Friday to send an important message that drinking too much is unacceptable with coworkers and while driving. Take your second cue from your knowledge of yourself and the effect of alcohol on your actions. Does one drink make you giggly? Do two drinks make you slur your words or lower your guard and chatter excessively? Does alcohol make you sick or feeling as if you have an upset tummy? If so, you may not want to drink alcohol at company events. This is a perfectly rational decision and you need to ignore any coaxing by coworkers to have just one. If you are uncomfortable attending the event, for any reason, please don't use alcohol to decrease your anxiety. This is a set up for a disaster, especially if you are not used to drinking alcohol. It's just as easy to carry water or a soft drink in your glass at the party and no one will know the difference unless you tell them—not that it's anyone's business but your own. This question comes regularly from readers, by the way. People wonder if coworkers are negative about employees who don't drink alcohol at company events. The answer depends on a lot on your company culture. As an individual, consider the effects of drinking too much on your relationships with your coworkers, your professional reputation, your manager’s ongoing regard, the office gossip mill, and your own view of yourself. You don't want to be the person who everyone is talking about the day after the party. And, know that your coworkers have long memories. You will hear about any gaffes you make again and again—and for years. Set your limit and stick to the limit you set. Don’t risk your professional reputation for a third or fourth drink at a company event. It's not worth the possibility that you will be remembered for your actions when you drank too much at the company event. You want to be remembered as a stellar professional who is always appropriate and contributing. Trust that this is best. What Can an Employer Do If an Exempt Employee Is Not Working 40 Hours?